Learning music up to Year 9, at my school anyway, really didn’t teach you a lot. Not to blame anyone involved as I’m sure there were challenges, but it’s actually crazy how little I can even remember about what we did in the lessons, especially considering that outside school I loved music and was surrounded by it. Kind of like how some kids are obsessed by rap music but it’s impossible to teach them about poetry — an artificial barrier has somehow got put up that needs to be torn down, or walked around. But it’s easier said than done. Anyway, this means that in later life I’ve sometimes taught myself bits and pieces of music theory in an effort to further my guitar playing, more for personal satisfaction than anything else. Recently, inspired partly by these brilliant articles about music theory in pop music, and partly by wanting to play nursery rhymes to my boy, I’ve read a bit about harmonisation. Following on from that, I’ve developed a harmonisation of Twinkle Twinkle Little Star that I am very pleased with. It’s a bit different to various ones that I’ve found elsewhere (which are generally either very simple or absurdly jazztastic and showy), so I will record it here along with the thinking behind some of my choices. If you just want the chords you can skip to the end. Optimistic — So maybe avoid minor chords? Soporific — So I want things to resolve nicely, and repetition won’t go amiss. Note: I didn’t actually set these rules out before I started. They are a post-hoc formalisation of very vague notions that I had in mind as I worked this stuff out by ear. But for the next song I do, perhaps I will write a set of rules like this — they might be helpful. Working in the key of C, most online sources have this line as C, C, F, C. I’m pretty happy with that — it’s about as simple as you could get, which is no bad thing here. For the fourth chord (on ’star’) you might harmonise the G note with a G chord, but I found that a bit strong. I quite like the idea that the first line just circles back around itself harmonically — it’s like dipping a toe in the pool before you dive in properly. What I did do was change the chord voicing for the C chord on the second ’twinkle’. The first twinkle gets the standard open C chord voicing for a guitar, but for the second one I put my little finger on the top E string, 3rd fret, to add an extra G to match the G note in the melody. This adds a bit of interest, and the higher note lifts the mood, without really getting more harmonically complex. I’ve notated this as an ’add12’ chord; I don’t really know if that’s right or wrong (and online curmudgeon Chronopops here says it is WRONG) but that’s what I mean anyway. 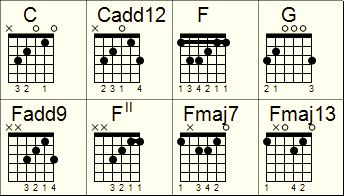 Again these are the same four chords that you find in most sources. Some people might use a C7 for the fourth chord to lead into the F chord in the next line, but I found that a bit harsh for the purpose. I suppose you could use an Em chord for the second one, or a Dm for the third one, to harmonise the E and D notes, but they didn’t sound right. The simple, childlike major chords seem much more apt than minor chords here. Here’s my first real innovation (at least as far as the sources I’ve seen go). How to harmonise the G note that starts this line? The options in our C major scale are: C major itself — but we’ve used that at the start of the two previous lines and the song is entering a new phase here, so I want a different chord; E minor — but that’s too sad sounding; and G major, the most common choice, but I didn’t want the line to start and end with G major, giving you two of the same chord in a row when the line repeats. So I looked elsewhere. The list above, you’ll note, suggests added 9th chords for their dreamy sound, so I went with Fadd9. That resolves nicely into the F that follows — perfect. It also continues the theme of the G note being picked out on the E string when it crops up in the melody, as with the Cadd12 chord in line 1. To me it sounds like the light is sparkling off that note. This is the same melody as line 3. Do I vary it? Nah — repetition is good in this case. Some people might end on a G7 to anticipate going back to the C at the start of line 5, but these dominant 7th chords are far too harsh for a lullaby. Exactly the same as line 1. Good repetition. Keeping this one simple sets up a mild surprise in the next line. Now this is a bit different, and it’s the line I’m most pleased with. The first F is the same as line two, but for the word ’wonder’, this time round, I sing it as E—C rather than the E—E you get the first time. That major 3rd drop is where the drowsiness really comes into the melody to finish the song, so I didn’t want to go with the C chord as before — I wanted something to catch the shift in mood. The only other basic chord in the key that contains both C and E is A minor, but that didn’t sound right. Instead I went for F major 7th, which as I say above, sounds twinkly so is perfect for this song. Using a more complex chord here also adds some gentle tension near the song (tension but not dissonance), which can be resolved at the end. Now how about the third chord? The note I’m harmonising here is a D, so I might go for a G or D minor chord. Instead, though, I preferred to give another gentle tug on the tension caused by the Fmaj7 by simply adding the D to that chord, making Fmaj13. I don’t normally have much truck with 6ths or 13ths but I stumbled on a nice voicing and I think it sounds great here. The way the bass note stops changing with the melody makes it sound as if the melody has started defying gravity, or as if the song is floating gently downwards like a leaf, ready to come to rest when the bass note does change on the final chord. Diagrams thanks to Einar Egilsson’s fab chord image generator. Try it yourself: the twinkliest Twinkle Twinkle Little Star.